The security of the customer data and its protection against unauthorized access is our highest priority. On the Vispronet® you can shop safely – we attach great importance to the security of your personal data such as bank account, credit card information and address. To achieve this we use the SSL encryption method recognized by experts. What is SSL and what does SSL mean? SSL is the abbreviation for "Secure Socket Layer". The SSL security technology ensures that your personal data, your login data and your order and payment information are securely transferred over the internet. The data is encrypted and is readable only to the ordering system. How can you recognize the SSL-encrypted website? On vispronet.de the entire order process is encrypted. As soon as security-relevant data is entered, the SSL certificate logo appears on vispronet.de. This logo verifies the encryption state of vispronet.de. Encryption is also visible in the changing url address line. The URL automatically changes from "http://..." to "https://.." (Abbreviation for HyperText Transfer Protocol Secure). We are particularly concerned about the security of payment transactions. Your credit and bank details are safe with us. Vispronet® meets requirements of the PCI security standard. 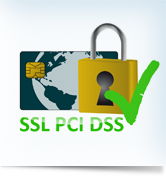 PCI DSS is the abbreviation for "Payment Card Industry Data Security Standard". These are security precautions which are required by the credit card companies to protect the data security and must be checked at regular intervals. Additionally, Vispronet® was awarded the Trusted Shops seal of quality and thus fulfills the quality criteria in terms of creditworthiness, cost transparency, customer service and data protection. The customers of Vispronet® are therefore offered an integrated purchase protection and a guarantee of Trusted Shops.